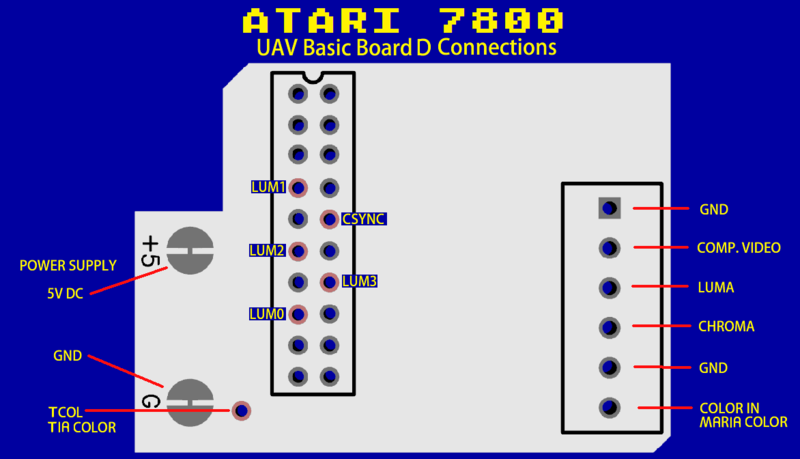 The single board can be used in virtually every Atari 8-bit console and computer. But since there are differences per machine and per UAV revision, you have to know exactly which wires, jumpers and pins are really relevant for your configuration. The long nature and discussion in the main thread make it hard to find the right information. Therefore I decided to create this separate thread. 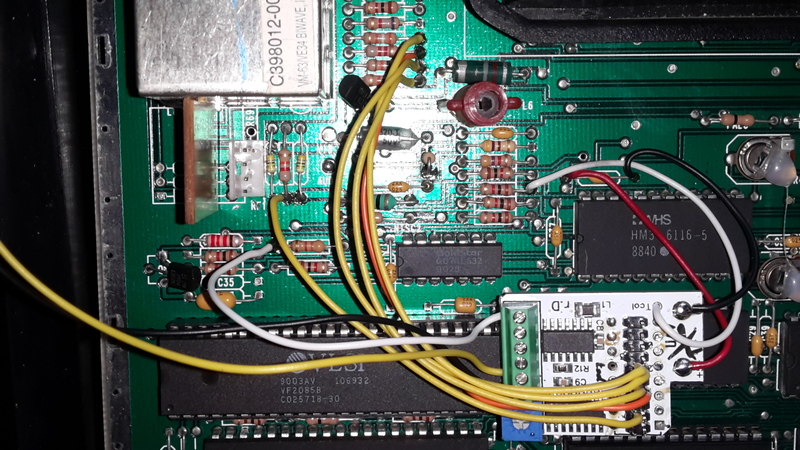 You cannot rely on any of the NTSC descriptions, because the PCB layout of the PAL version is completely different. 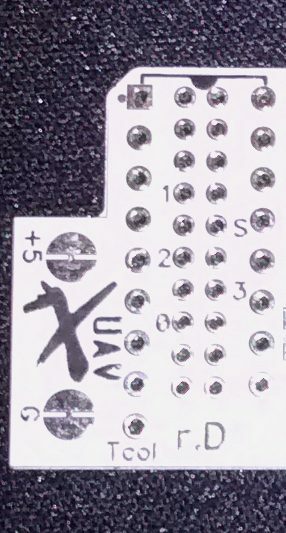 You do not have to remove and existing parts from the board for the UAV itself. You may have to remove parts to grab the audio correctly, but that is a separate topic and not related to the UAV itself. You have to use the UAV BASIC Rev. 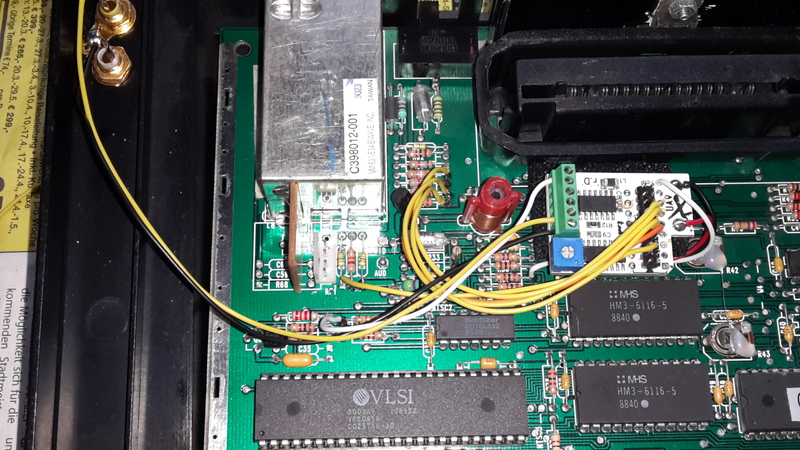 D board without connectors because there is no driver 4050 chip in the Atari 7800 but a 7432 chip which combines the video signals from TIA and MARIA into one. 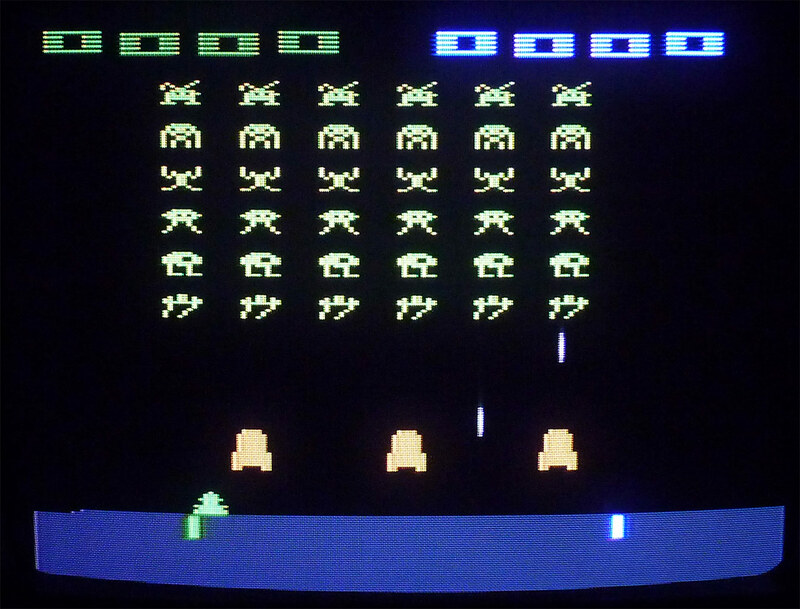 Basically you grab most of the required signals from the resistors connected to the 7432. You will typically not be able to read the Rxx, Cxx labels on the populated board. Therefore is it important to know where to connect what. When connecting to resistors, use a meter to check the value of the resistors to make sure you are at the right place. 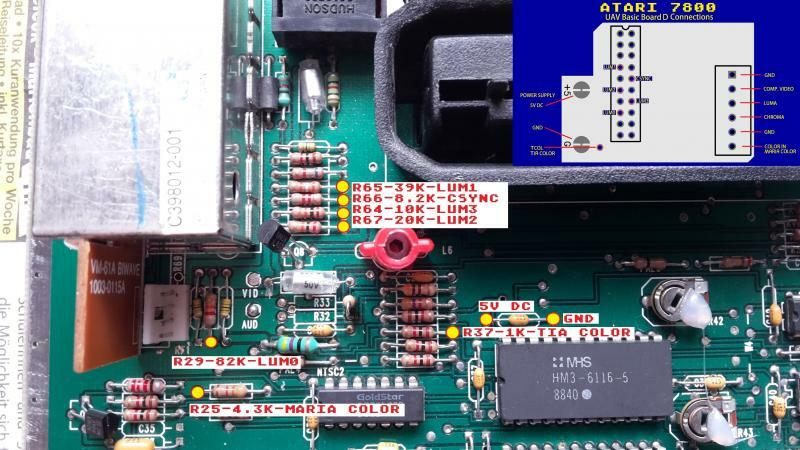 The Atari 7800 PAL schematic from Jerzy Sobola is very good, but incorrectly states R29 to be 12k but it is 82k. Note that on the "wires 1/2" pictures the yellow and orange wires were yet at the wrong pins on the UAV board. Use the ones in the "UAV Points" picture. Crap is the a ton of solder points! Anyone play tower toppler bonus round and compare to the RF version? Thanks for the info! 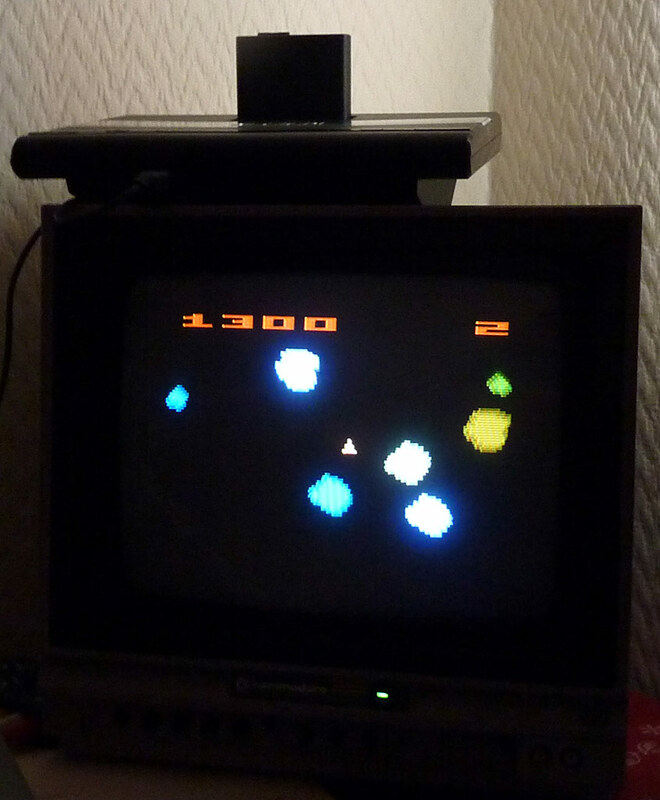 Especially because I don't have access to a PAL 7800. One quick correction, these are the input pad locations. They are different than Rev C.
That's because there is no 4050 to plug and play with. There are 8 solder points and they are all simply on one end of a resistor, so actually easy to do and remove if required. Awesome post dude, just dropped a UAV into my PAL 7800 following your instructions and it works marvellously. A little bit of jailbar interference, but it's nothing major at all. Really quite pleased with the results. Wow - JAC - does this mean we should look out for a 7800 demo soon? Yo' juansolo... your colors are waaaaaaay off! Can you not dial them in by adjusting the bottom trim pot inside your machine? I actually blame my camera. To the naked eye Space Invaders are yellow, the barriers orange and the bottom grey. The camera really seems to go a bit mental on colour for some reason. Also that's a PAL 60 conversion SI... Of which I have 3 and they all come out with completely different colours... Also the NTSC colour palette and PAL one are quite different. Edited by juansolo, Sun Oct 1, 2017 2:25 PM.